Paul Marshall grew up in the woods of northern Maine under the shadow of Katahdin. He lived a poor but idyllic childhood in a one-room tarpaper shack with his parents and six siblings. His world changed when he was called to serve as a combat medic during World War II. In Europe he saw so much destruction and despair; images that would haunt him forever. Two decades after the war Marshall was given a chance of a lifetime to turn the tide of destruction to hope. In 1964 Marshall, with his wife and three children, moved to a south Pacific island lagoon called Truk, where he built and ran a school for future Micronesian leaders. 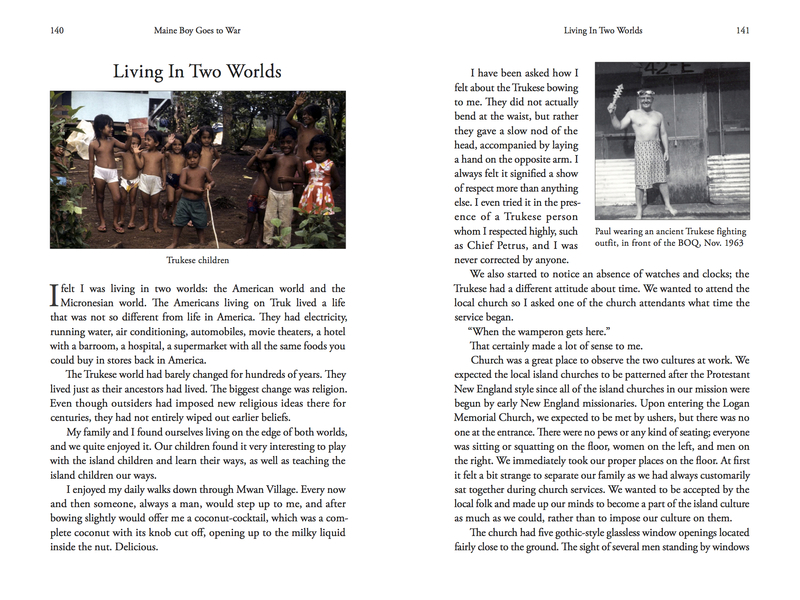 On the island he saw how the same super powers of World War II had also dominated and oppressed the people of Micronesia, and he set out to find a way to encourage their autonomy and freedom through the power of love and family. I started working with Paul on his book in late 2013, coaching him to write and structure his book. I provided content development, line by line editing, and project managed the final stages of copy editing the manuscript, book design, printing and publishing.